Double sided Stainless Steel Sport ID Bracelet, raised Emblem Double sided Stainless Steel Sport ID Bracelet. 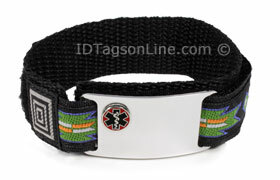 Sport ID Bracelet, IDSP34 (ID Tag size 1-5/8" x 7/8"), is made from .062" thick premium grade Stainless Steel. It is guaranteed to be rust free for life. The enameled medical logos, which are attached to the plate, come in either red, blue or pink colors. You can, also, choose plain bracelet without logos. "Safari" ornamental wrist band is universal and fits any size up to 8.0" max. Metal ID tag will never touch your skin and will provide complete mobility and comfort. We can engrave 12 lines total: 6 lines on the front (3 lines with 12 Characters and 3 lines with 16 Characters in each line) and 6 lines on the back (16 Characters in each line) of personal or medical information on the tag.